A true ski in / ski out experience! Just off Serwas run and minutes away from the village. This 4 bedroom 3 bathroom chalet in Snowy Pine Estates boasts 25 foot high vaulted ceilings and windows floor to ceiling. The massive views of the valley can be seen from the kitchen table, hot tub, living room and master bedroom. We cater 3 day Min Stay Vacations and only request a 5 day stay during new year. Imagine yourself sipping coffee by the gas fireplace as the sun comes up over the mountain tops and getting ready to gear up and hit the slopes. After your day on the slopes or relaxing in the chalet there is a full kitchen where you and your loved ones and friends can enjoy an amazing dinner, BBQ, drinks and laughs. Brand new 51' flatscreen, Blu-ray Player, Apple TV, Xbox and stereo system. Guests have told me they enjoy watching the Saturday night fireworks from the hot tub while enjoying a glass of wine! We’ve got free wifi, gas fireplace, sparkling clean hot tub serviced daily, lots of parking, only 10 steps and 5 stairs to the front door, wine glasses and cookie sheets. Just outside the front door there are also greats spots for kids to go sledding, snowshoeing and a snow machine trail from Happy Valley. All linen and bath towels are cleaned and ready for your Five STAR stay at The Natural High. We would be delighted to have you as guests this season. The good news is, at Big White, the snow is great every season! Big White is the best skiing in the world. Remember it takes 90 minutes to dry your clothes at this elevation! Cappucino maker, coffee maker, wine glasses, toaster, kettle, baking sheets, cake pan, pie sheets, wine bottle opener, Juice Jug, cutting board, dish soap, scrubbers. Salt, pepper, flour, some spices, oil, vinegar. Lots of tea towels and dish cloths. Channel 2 is the Big White Advertising channel. Plug in your music (iPod, iPad, iPhone, Computer) into the stereo and set to Tape 2. View of the beautiful valley and Saturday night fireworks. Serviced daily. A great ski lodge for families, close to the ski out for snowpines, and easy to ski in down to ridge rocket. clean, comfy, great hot tub! Had a great time staying at this property had everything you need for a comfy vacation. 5 mins to the main ski lift from the front door and easy access back home after a great day on the slopes from the serwas ski run. Joe was a great host and readily available to answer any questions or concerns we had. Private hot tub was welcomed at the end of the day. Would stay here again for sure. comfortable for our group of 8. We found the property to be pretty much as advertised and comfortable for 8 people. The hot tub and wifi worked and the unit was well supplied with all the essentials. However when we arrived the unit had not been cleaned after the previous renters. Beds unmade, linens unwashed, and floors needing to be vacuumed. To his credit Jo responded immediately to my message. In a matter of seconds. He apologized and said he would follow up with the cleaners. In the meantime, Jo provided a cash reimbursement and comped us some lift tickets. A satisfactory response in my opinion. The skiing was excellent and like I said we were comfortable in this property so this little issue didn’t really affect our overall stay. Jo was very responsive and accommodating and I would recommend this property. Spacious retreat for two families of 4! Our families had a great, relaxing stay at Jo’s slice of heaven. Lots of room to relax after long days of skiing, with well appointed kitchen and cozy fireplace to take away the chills after snowy days in the hill. Jo was a great host, reaching out by text and phone before we checked in to make sure we were all set to arrive. There was a power outage on the hill and Jo was super responsive to queries when the hot tub wasn’t working later in the day - the circuit breaker tripped and he guided us to the sub-panel to get the soothing water circulating again. Like other guest comments, ski in and out was easy once we figured it out... only recommendation would be for Jo to make a map with clear instructions on the in and out locations and include that in the arrival document he sends to guests. Our family stayed at Jo’s cabin for five nights over spring break with another family. We had such a great time! There was more than enough room for all of us. The cabin was well stocked and had everything we needed! We took advantage of the free shuttle which came every half an hour to take us to the village or we enjoyed the walk on a lit path. We snowboarded for four day and the cabin was easy to access off Serwas, dropping us off across the street. We would have been able to snowboard to the front door had there been snow on the road! For ski out, we just had to walk a small distance on the road before we hit a trail. Jo is a hospitable and caring host and we would definetely stay here again. We were at Big White for a family ski weekend. The condo suited our needs quite nicely. 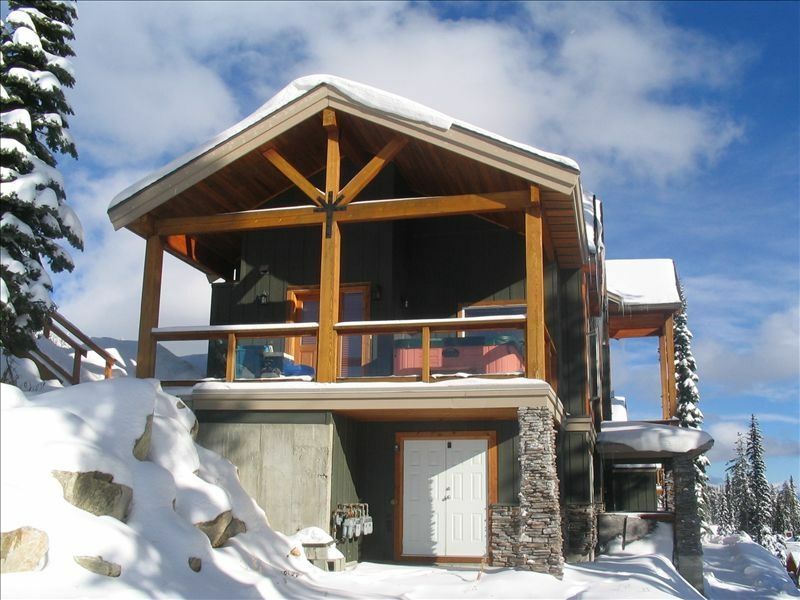 It is well located for ski in/ski out, has a private hot tub and comfortably sleeps 9. Jo was good at responding to questions and checking in to see if everything was okay. Overall a great weekend get away. Great sledding right outside the door for kids! 3 minute drive or snowmobile ride to Happy Valley and Village Big White family and adventure activities!